Yes, a few glasses of champagne do soften the pre-speech jitters. Ten shots of tequila, however, may have an adverse effect and lead you to being more prone to emotional rants (further divulged below). While emotional revelations may be heartening when shared between you and the receiver of the comments in privacy, when shared with a room full of strangers who know nothing of your “heart-to-heart’s” personal references, the mood becomes rather unpleasant indeed. This is also an excellent segway into taboo number two. One simple rule of social psychology: no one likes to hear stories that they are not part of or cannot relate to. Unfortunately, us human beings are in our deepest rooted nature quite self-interested. While we may be happy for your relationship with the bride or groom in question, they don’t want to hear your long elocution about your many forgettable night-outs. If you can’t help but share a memory; keep it short and ensure your listeners can relate to it in some way or another. This one is so simple, and yet we’ve seen so many overconfident wedding speech goers fail to follow this simple rule. Take yourself back to your university days: even the most enthralling lecturer fails to captivate his listeners for long before minds start to wander, and restlessness can’t help but eventually eclipse rhetoric. 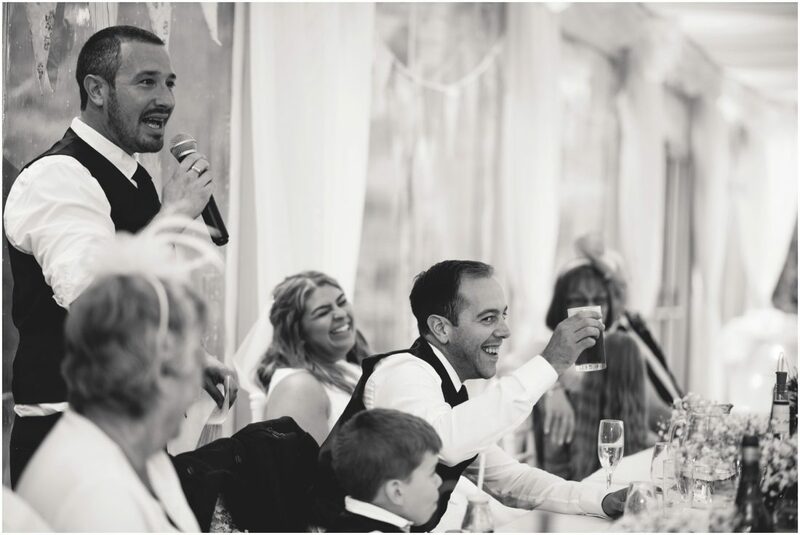 Taken on average, the most in-demand wedding planners have come to the consensus have listed the 8 – 20 minute scale to be the colloquial “sweet-spot” to deliver a successful speech. This time leaves room to touch upon all compulsory ingredients that make a wedding speech pleasant for all guests and indelible for the lucky bride or groom it is intended for. So what’s a speech-maker to do? To concoct a speech that leaves all members of your audience at ease, while your speech should deliver consist upon three staples: a tailored emotional statement, a touch of humour, a succinct and impactful closing statement. Your speech should be neither a diatribe of emotional rhetoric nor a comic show. What it should be is concise, and meaningful. Make every word count. Also, don’t forget that there are two people involved in this ceremony; do not neglect to at least acknowledge your respect or happiness for the union of both bride and groom, albeit you may be closer to one than the other. Your speech should celebrate the unity of two people, not the remembrance of memories shared between you and one of these said people. All jokes, gestures, or compliments should be centred around the love of two. Your role as the ambiguous “third,” or the speechmaker, is to accentuate the light and love between two people; and yes, the path to doing so is often achieved in the form of humour. Yet, do not let the punch-lines of your joke compromise the message you aim to deliver. While you believe it or not, both bride and groom will cherish the memory of your speech for years to come.